High blood pressure, also known as hypertension, affects 1 in 3 adults in America. If left untreated, high blood pressure increases your risk of heart disease, stroke, kidney disease, vision problems, and cognitive decline and dementia. 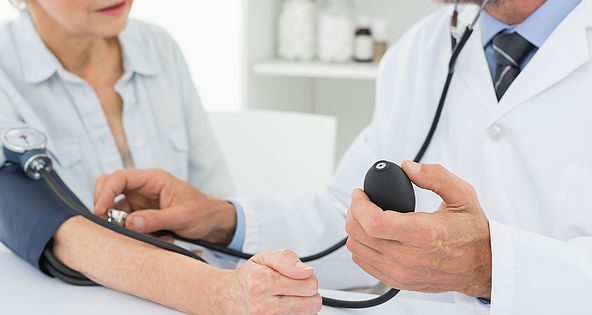 Although most diagnosed hypertension is “essential” meaning the cause is unknown, there are factors that can contribute to high blood pressure. These include poor nutrition and sedentary lifestyle, insulin resistance, metabolic syndrome, elevated uric acid levels, and more. Additional triggers include alcohol use, sodium intake, smoking, stress, and obesity. Research shows that excess sugar in the diet not only is a precursor for diabetes, but also for hypertension, even more so than sodium! The main source of excess sugar is processed foods and drinks. Patients who are taking medication for hypertension are often on multiple drugs, and unfortunately they can still be ineffective for some patients. Not to mention these drugs have long-term side effects and rob you of key nutrients your body needs. So what can be done to prevent hypertension or normalize it if you already have it? There are many options to take, and most likely your doctor has not talked to you about these important factors. As insulin levels rise, it causes your blood pressure to increase as well. It can also cause your body to retain more sodium. Therefore one of the most important dietary changes one should make is to eliminate or dramatically reduce sugar and processed fructose from your diet. Eating sugars and grains (bread, pasta, corn, potatoes, rice) will cause insulin levels to remain elevated. Instead of a diet high in carbs, sugars, processed foods and trans fats, switch over to a whole food (preferably organic) diet. Incorporate fruits, vegetables, healthy fats, and grass fed protein sources. Examples include berries, leafy greens, beets, celery, carrots, garlic, sweet potatoes, avocadoes, grass fed butter, organic pastured eggs, coconut oil, raw nuts, and grass-fed or pasture-raised meats. The options are endless! Both omega-6 and omega-3 fats are essential for health, but most Americans are getting way too much omega-6. The goal ratio is 3:1 omega-6 to omega-3, but the average has increased to a 30:1 ratio! Omega-3 is vital for healthy blood pressure, and studies comparing serum levels found the individuals with the highest omega-3 levels also had the lowest blood pressure readings. Omega-3 fats are in plants and marine animals like fish and krill. Although not often discussed, there is a link between stress and hypertension. Not only is emotional stress important, but also physical stressors such as smoking, excessive physical activity, overeating, excessive alcohol, and more. Incorporating exercise into your regime has many benefits, not just for hypertension. Depending on your overall physical condition you may need to talk with a health care professional about a proper program. Aerobic activities such as walking, jogging, swimming, biking, and weight-bearing exercises are all beneficial for lowering blood pressure. And you do not need to spend an hour a day working out; there are many videos online for high-intensity interval training (HIIT) workouts. HIIT workouts are quick (around 10 minutes) and intense to get the most time effective exercise. Vitamin D deficiency is associated with arterial stiffness, hypertension, insulin resistance and metabolic syndrome. The best way to get vitamin D is via sunlight, but that is not always possible depending on where you live. Supplementation with D3 (NOT synthetic D2) is recommended to get to a serum value of 40-80 ng/ml. Your doctor can run blood work to determine your initial vitamin D levels and recommended daily supplementation. There should be a proper balance between vitamin D, vitamin K2, calcium, and magnesium to decrease hypertension and no increase risk for heart attack or stroke. These are just a few options if you have hypertension. Discuss with your doctor if you have hypertension and what can be done for you specifically to normalize your blood pressure.